Finally, Rosé wines are beginning to get their due. For years, Rosé has been nearly as taboo among serious wine drinkers in this country as its evil twin, White Zinfandel. To me, that lack of respect is nearly criminal, especially since Rosé wines are so versatile and pair so nicely with so many different types of food—from grilled lamb, sushi and Indian curries to spicy Mexican cuisine, seafood and pasta dishes. I can’t think of another wine that so deftly covers the waterfront, food-wise. But thankfully, Rosé is finally beginning to appear on restaurant wine lists and in people’s wine cellars. Kudos to restaurants like The Copper Onion, which is actually offering a spectrum of Rosé wines with its “Summer of Rosé” wine list selections this summer. Rosé is technically a red wine, but one that drinks more like a white wine. It’s made from red grapes—often Grenache, Mourvedre or Cinsault—but during production, the grape skins, which give color and tannins to wine, are left in contact with the grape juice for only a matter of hours, as opposed to days or even weeks for most red wine. That limited skin contact results in the wine having a pinkish hue, but very little in the way of tannins. This makes Rosé an easy-drinking wine and one that can be served chilled, like white wine. Perhaps because of its pink color, Rosé is assumed by many people to be sweet. And it can be, especially in the bastardized incarnation known as White Zinfandel. But French-style Rosé can be very dry (not sweet), as well as somewhat sweet (off-dry). Since it’s usually served chilled, Rosé is perfect for sipping on the deck during the summer months or as an accompaniment to meats and seafood from the grill. But it’s not a wine to ponder or to put away for aging. Rosé is always best consumed within a year or two of its release. Vintages don’t matter. On my first visit to France, the biggest surprise I encountered was the amount of Rosé that the French drink. From Paris to Provence, carafes, glasses and bottles of Rosé are guzzled in surprising quantities, with little fanfare. It’s the perfect bistro wine to sip at a sidewalk table. There was a time when Rosé options at Utah wine stores were dismal. Now, I count more than 40 Rosé wines (also called Rosado in some places) listed in the DABC inventory. Producers range from France, Italy and Spain to Argentina, America, South Africa and Australia. One of my current favorite Rosés—although I don’t think it’s widely available here in Utah—is 2011 Rosé of Old Hill Ranch ($20), made by Sonoma wine wizard Will Bucklin. It’s crisp, with hints of green apple (yes, green apple). Try to track some down if you can. If not, there are plenty of other great Rosé options available, many of which are very economically priced. Fisher’s Unity Rosé ($14.99) is a solid choice, made from a Pinot Noir/Cabernet/Malbec blend. A fantastic Rosé choice from California is Lorenza ($17.99), a multilayered, complex, dry wine made with MourvÃ¨dre, Cinsault, Grenache and Carignan. Saracina Vineyard’s Atrea Skid Rosé ($14.99) from Mendocino is another good one, composed of Malbec and Grenache. 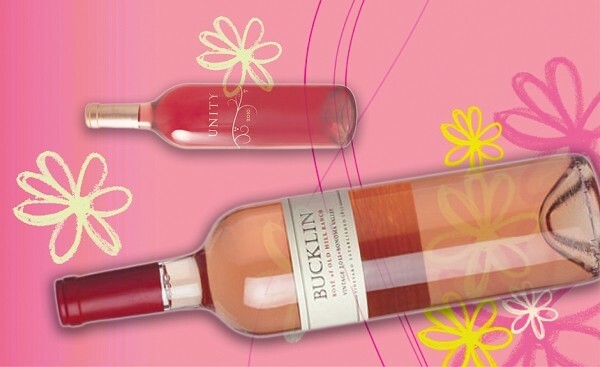 There are oodles of other Rosés worthy of your attention, in a wide range of styles. Among them are Alois Lageder Lagrein ($17.99), Le Cirque ($11.99), Heitz Grignolino ($20.51), Domaine du Poujol ($16.99), Cline Mourvedre Rosé ($10.95), Charles Joquet Chinon Rosé ($22.97), A to Z ($10.99), Soter ($14.99), Domaine de Terrebrune Bandol Rosé ($28.99) and Chateau de Trinquevedel Tavel ($19.96), just to name a few. When the weather is warm, it’s time to think pink.